Chou Chou! 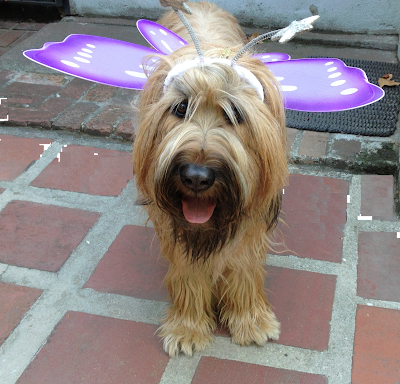 Adventures of a Briard Girl : Happy Halloween! She did lots of tricks and earned lots of treats! What a perfect Halloween costume for Chou Chou: in Japanese, chou chou means butterfly! I had fun dressing her up. We didn't go trick or treating. She just waited in the yard for the children to show up. But the trick or treaters didn't come until after dark, when Chou Chou was inside; they missed seeing her costume.